See in Glossary or any other built-in ones. This is a great way to add a user interface to a sub-system for your game. Create a script that derives from EditorWindow. Use code to trigger the window to display itself. Implement the GUI code for your tool. In order to make your Editor Window, your script must be stored inside a folder called “Editor”. Make a class in this script that derives from EditorWindow. 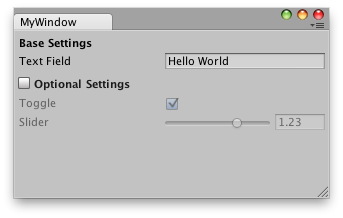 Then write your GUI controls in the inner OnGUI function. MyWindow.js - placed in a folder called ‘Editor’ within your project. In order to show the window on screen, make a menu item that displays it. This is done by creating a function which is activated by the MenuItem property. The actual contents of the window are rendered by implementing the OnGUI function. You can use the same UnityGUI classes you use for your ingame GUI (GUI and GUILayout). In addition we provide some additional GUI controls, located in the editor-only classes EditorGUI and EditorGUILayout. These classes add to the controls already available in the normal classes, so you can mix and match at will. Custom Editor Window created using supplied example. For more info, take a look at the example and documentation on the EditorWindow page.